Auckland District Health Board is using funding from Dry July 2014 to replace 15 therapy chairs with adjustable bionic therapy chairs. These chairs will allow patients to be put into emergency position should they become unwell during treatment. Funds are also going towards 20 new waiting room chairs and 2 lounges for Acute Oncology and iPads for medical oncology patients to use during treatment. Dry July funding is being used to convert an existing back office on Ward 64 of Auckland City Hospital into a dedicated patient/family/whanuau meeting room to promote respect and privacy for the patient/family/whanau. This will facilitate the private delivery of bad news and difficult conversations, especially for those in 4-bedded room, as well as dissuade “corridor conversations” between health care professionals and patient/family/whanau. 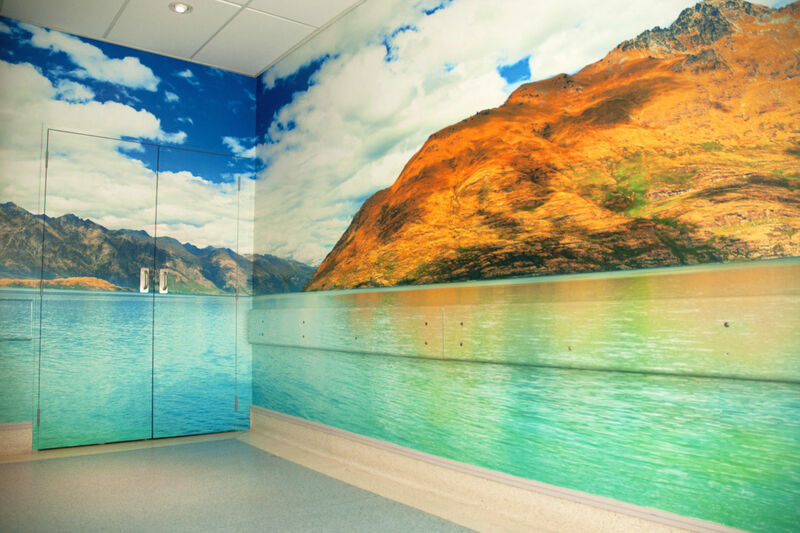 Christchurch Hospital used Dry July funds to install beautiful murals and ceiling pictures of New Zealand scenery in the Radiotherapy Department. 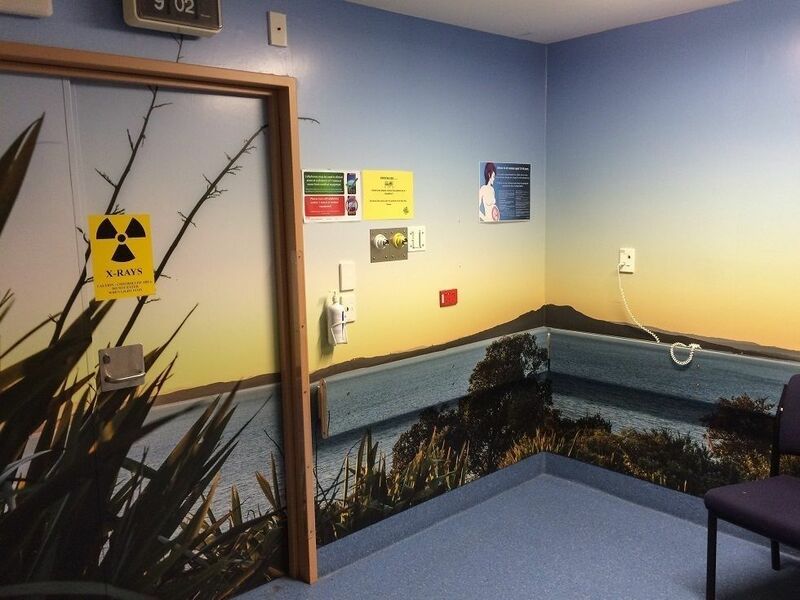 CDHB Radiation Therapist Laura Ross is a big fan: “The murals cover the walls leading into the treatment rooms and the ceiling pictures are placed for patients to look at while lying on the beds. In the Planning CT Scanning Room, we have a lovely picture of Hokitika Gorge on our ceiling. As the first place in the Radiotherapy Department that patients visit, they can be quite anxious and nervous. In a room full of large machines and medical equipment, it is so nice to have a tranquil picture for patients to look at. Whether the patients try to guess where the scene is, reminisce about a time they were there or comment on how beautiful the colour of the water is, our Hokitika ceiling picture is something patients always notice and talk about. These images really brighten up the Radiotherapy Department and have been a wonderful addition for the patients. 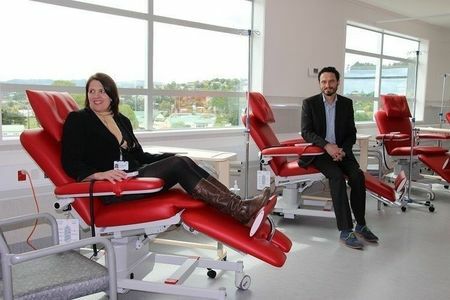 Funds allocated to Northland DHB from Dry July 2014 were used to purchase three new oncology treatment chairs at The Jim Carney Cancer Treatment Centre, opened in September 2014. Pictured are Oncologists Lisa Dawson (left) and Vince Newton with the new chairs. These new chairs will make cancer patients receiving their treatment at the hospital a little more comfortable. - Variable height seating - some patients find it difficult to get in and out of normal height chairs. Having some higher chairs assists with this issue. - Hi flex tables - higher tables to go with higher chairs, these allow patients to distract themselves whilst having chemotherapy as they will have a surface they can use for laptops, books, drinks etc. - Humidifiers - these provide increased patient comfort by keeping the mucus membrane moist for head and neck patients undergoing radiation therapy. When the membrane dries out, patients find it difficult to eat and drink and are often admitted to hospital as a result. - Electric examination beds - beds that can be lowered to allow patients to get on the bed much easier have replaced static beds.